It may seem that difficult people are everywhere! This session equips participants with specific strategies to deal with difficult behavior. These tools assist in reducing stress; raising morale, increase effectiveness – in short making work and life less stressful and more productive. Participants learn to identify specific types of difficult behavior and people and how to respond to each type. The session addresses how to neutralize the effects of negativity, hostility and aggression. To further support these strategies, participants learn what behaviors of their own only increase and prolong difficulties. Can be tailored to a half-day conference segment. Motivation: How to Get It, Keep It and Pass It on! Motivation is often said to be lacking in many organizations. Without it, performance and results suffer. There are specific, proven strategies to foster motivation. A component of ‘creating resilience’ is included. This workshop explores these strategies, the mastery of consistently applying them and integrates specific techniques to fuel motivation. This workshop covers testifying skills for deposition, hearing, and trial. 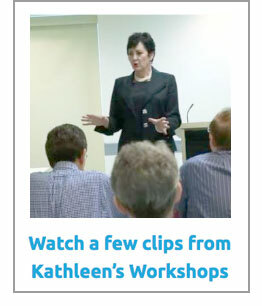 It equips participants to know what to expect and the tips to make them an effective witness. The session includes a mock exercise for both deposition and trial. Make your meetings more positive, effective and dynamic! This session examines what makes a meeting effective, the consequences of a nonproductive or negative meeting, what should be expected from meeting leaders and participants, establishing and conveying ground rules, how to format, techniques for controlling disruptive behavior, and how to clarify expectations about participation. 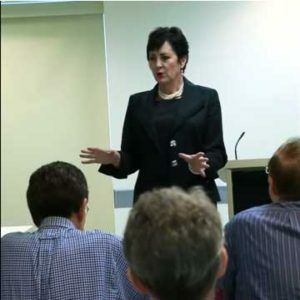 As an advanced level Toastmaster, Kathleen is experienced with mentoring and evaluating presentations. If you are a nonprofit organization, similar skills are embodied in our Creating Influence workshop. This workshop fosters specific skills and results. This session builds the leadership pipeline. It invigorates employee fulfillment and loyalty, ensures the viability of the organization’s future and supports leaders in developing people to their fullest potential. This workshop frequently includes a component of Myers-Briggs or DiSC for coaching integrated with behavioral style or type preference. Whether working a tradeshow, convention or festival – a few key points and strategies will take your tradeshow results from “We were represented” to “We got a lot out of the at tradeshow! People are more confident and effective when they know what to expect when testifying, whether for deposition, hearing or trial. Preparation is key. This program serves as a support and in cooperation with legal counsel. This is one of our most popular courses, it is generally paired with DiSC as it applies to negotiations. It is applicable where negotiation or dispute resolution skills are needed. Kathleen received special training within the United States Department of Justice on alternative dispute resolution and negotiation. This course is designed to contain a mock exercise adapted to your industry or business. Ideal Timeframe varies depending on whether the mock exercise is included.